xkcd: A webcomic of the internet, small talk, meta discussions, and whimsical phantasmagoria ~ Hot Damn, Data! I've recently rediscovered my affection for xkcd , and what better way to show it than to perform a data analysis on the comic's archives. In this post, we use Latent Dirichlet Allocation (LDA) to mine for topics from xkcd strips, and see if it lives up to it's tagline of "A webcomic of romance, sarcasm, math, and language"
A conventional approach to grouping documents into topics might be to cluster them using some features, and call each cluster one topic. LDA goes a step further, in that it allows the possibility of a document to arise from a combination of topics. So, for example, comic 162 might be classified as 0.6 physics, 0.4 romance. Cleaning up the text required a number of judgement calls, and I usually went with whatever was simple. I explain these in comments in the code - Feel free to alter it and do this in a different way. I'm not going to cover the details of how LDA works (There is an easy to understand, layman explanation here, and a rigorous, technical one here), but I'll tell you what output we're expecting: LDA is a generative modeling technique, and is going to give us k topics, where each 'topic' is basically a probability distribution over the set of all words in our vocabulary (all words ever seen in the input data). The values indicate the probability of each word being selected if you were trying to generate a random document from the given topic. Each topic can then be interpreted from the words that are assigned the highest probabilities. I arbitrarily took the top 10 words from each topic, but we could wonder how many words actually 'make' the topic. 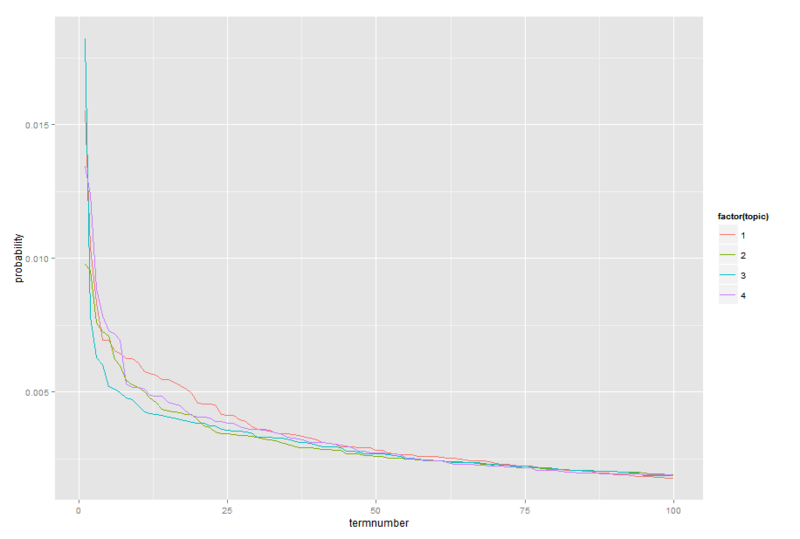 This plot graphs the probability associated with the top 100 words for each topic, sorted from most to least likely. As expected, most comics draw largely from one or two topics, but a few cases are difficult to assign and go all over the place. Thank you for sharing. Your code teach me a lot! Thanks for writing this up, it was a really interesting way to use LDA and topic modelling! I laughed quite a bit when you said that the objective was to see if xkcd 'lives up to it's tagline of "A webcomic of romance, sarcasm, math, and language"'. How did you get the idea for this? 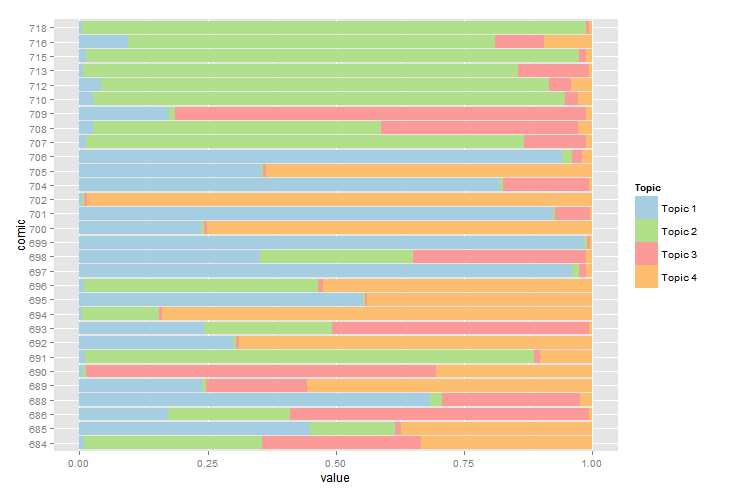 Also, thanks for sharing the code and plots, it's given me some things to try for my own work using topic modelling. Glad you liked the post! I just wanted to learn more about LDA and topic modeling, so I started looking for an interesting dataset, and at the same time, I had an xkcd comic open in my browser. I took that as a sign, and went for it. Let me know if you end up doing some interesting analysis in a similar vein. I'd be really interested. And if you feel that some of my code could be helpful, go right ahead and fork on GitHub. An excursion into data-driven analysis and application of machine learning to quirky problems. Born and raised in a luxurious lifestyle, completely unexposed to adversity and hardship, the author has, since then, overcome these hurdles to become a poster of mediocre content on the internet.